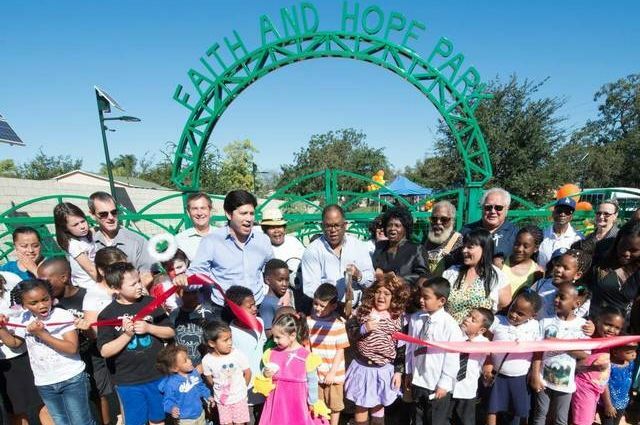 Built with Proposition 84 funding by the Los Angeles Neighborhood Land Trust, Faith and Hope Park showed how successful park bonds can be if the language is sufficiently explicit. 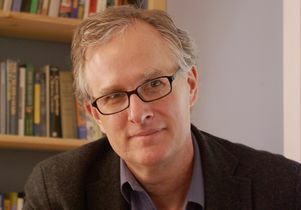 Jon Christensen is an adjunct assistant professor in the UCLA Institute of the Environment and Sustainability. This op-ed appeared in the Sacramento Bee. Where was that funding spent? Who benefited? And was the spending prioritized as voters expected? We analyzed $2 billion spent on 2,174 projects in California communities and found decidedly mixed results. Our study was not an audit of individual projects. Nor did we examine purely environmental benefits. We looked at benefits for people and communities. And we found that when priorities were clearly spelled out, funds were spent as promised. But when priorities were left vague, what voters may have expected from the measure was not always what they got. Although “local parks and urban greening” were listed as priorities for Proposition 84, communities that lack parks received less money than those that already have parks. Less dense rural areas received just as much funding as cities jammed with park-starved people. Rural residents within a half-mile of funded projects saw $7,475 per capita in spending in their neighborhoods, compared to just $209 per capita for urban areas. Disadvantaged communities, which were prioritized in several sections of the proposition, got less than communities with higher median household income. The criteria and process for selecting projects were carefully spelled out in AB 31, the Statewide Park Development and Community Revitalization Act of 2008, sponsored by then-Assemblyman Kevin de León, now Senate president pro tem. That money went to the priorities approved by voters. In other words, it worked. A $3 billion parks bond sponsored by Assemblyman Eduardo Garcia could be on the ballot this fall. De León is also working on a bill. Garcia’s measure incorporates some of the lessons of Proposition 84. A third of the money would be administered under AB 31, and a good portion of the funding would be distributed proportional to population. That’s a good start. People need to be in the equation. But it could go further. More funding could be explicitly prioritized for disadvantaged communities. There should be more explicit articulation of priorities and criteria for every section of funding – not just for parks, but for other conservation projects. And explicit requirements should be written into law for better data reporting. Future Californians should have a clear picture of how their money is being spent. 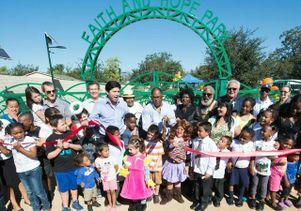 People gather for the opening of Faith and Hope Park in Los Angeles.